Map above derived from: Building the Navy's Bases in World War II: History of the Bureau of Yards and Docks and the Civil Engineer Corps, 1940 - 1946, volume II, United States Government Printing Office, Washington, DC 1947, page 256. Tulagi, with a circumference of about 3 miles, was the seat of government for the British Protectorate of the Solomons [Solomon Islands]. In October 1942, a detachment of 59 men of the 6th Battalion was sent from Guadalcanal to Tulagi to build a PT-boat base at Sesapi. The strength of the detachment was later increased to 133 officers and men. First, an emergency outlet channel for Tulagi harbor was dredged and blasted to avoid having PT boats bottled up by enemy warships. Two PT-boat floating drydocks were assembled from pontoons; a 500-man camp was set up; and power and telephone systems to serve the island and harbor area were installed. The detachment also furnished a number of carpenter details to assist with the maintenance and repair of PT boats. By August 1943, the facilities at the Sesapi base had been augmented to provide more shop facilities and storage areas, to permit major PT-boat overhaul. A repair and service unit was set up able to support 40 PT boats in combat operations. The Seabees also built three small wharves for PT boats. Much of this later work was done by the 27th Battalion. In addition, PT-boat facilities were constructed on the island of Macambo [Makambo], with base housing at Calvertville on Florida Island. An existing concrete wharf at Macambo, in need of repair but still serviceable, was used, but it was necessary to build torpedo overhaul and storage facilities. 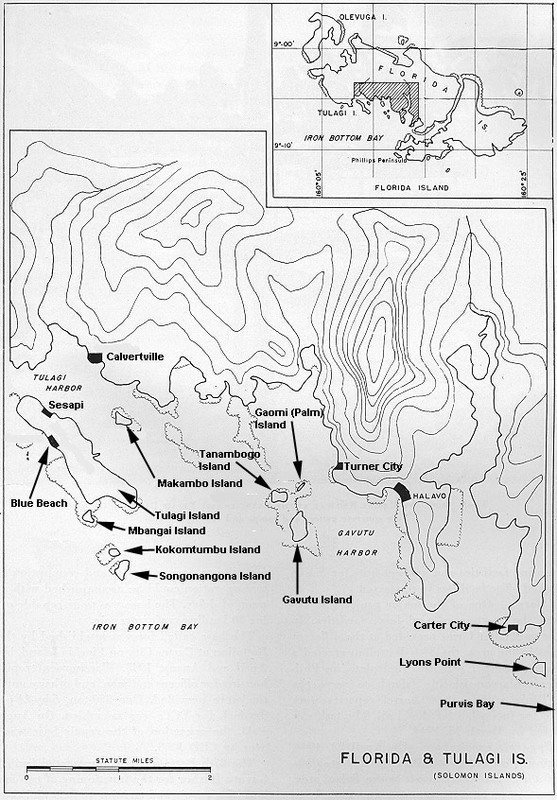 In July 1943, PT Squadrons 1, 3, and 8 were using the Sesapi and Macambo bases. Two 1,000-barrel tanks for aviation gasoline were erected at Sesapi, and eight 1,000-barrel tanks at Macambo, with loading line to the dock. 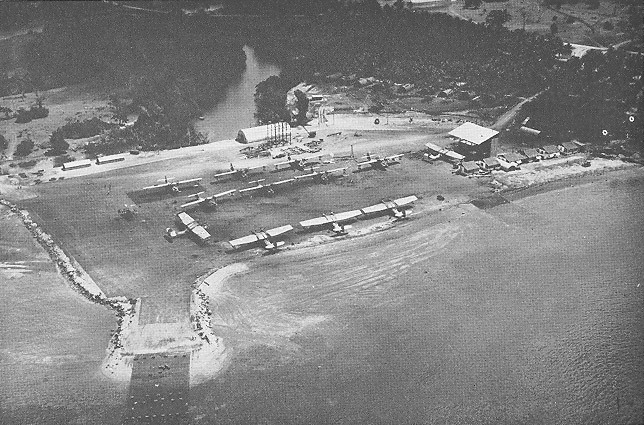 Halavo seaplane base - Before leaving the Tulagi area in January 1943, the 6th Battalion detachment began construction of a seaplane base at Halavo on Florida Island; the completion of this base became the major task of the 34th Battalion when it arrived on Tulagi on February 12, 1943. A tent camp was erected for 1500 men and 300 officers. In planning for the seaplane facilities, due to the shortage of cement, it was decided to use steel mat on the ramps and apron. A temporary mat ramp, 25 feet wide, had been completed when priorities for work at Halavo were reduced in May to allow concentration on work in the Russells and on Guadalcanal. Priorities were then established as follows: (1) base roads, (2) a 12,000-barrel tank farm, (3) a small apron without mat. Toward the end of June, a squadron of 15 PBY's was added to the scouting squadron already operating from the base, and another temporary ramp of steel mat was laid for their use. Construction of the tank farm was completed, including a filling line to the beach and a delivery line to the ramp. Thirty wooden buildings for administration and shops were constructed as fast as the output of the local sawmill permitted. The marston-mat ramps were considered wholly satisfactory in service, and it was estimated that their substitution for concrete saved about two months' construction time. In late 1943, the scope of the Halavo base was revised upward, the new plan calling for an increase in apron area, structures more permanent than the original canvas-covered ones, and the reconstruction of housing facilities. Two ramps of marston mat, 50 feet wide, were installed. Dock facilities were constructed, consisting of a small-boat wharf, 16 feet by 72 feet, and a boat refueling wharf, 6 feet by 50 feet. Twelve screened frame wards with canvas roofing were provided for a 200-bed base hospital. In September, ten quonset huts, 20 feet by 48 feet, were erected for quarters. The aviation-gasoline tank farm was filled to capacity through the newly completed sea-loading line. By December 1943, three PBY squadrons occupied the base, and the scouting squadron had been moved forward. New housing facilities and quonset huts for NATS storage and office facilities were erected. Landing-craft repair base - On April 22, 1943, instructions were received calling for the establishment of a base for landing craft in the Tulagi area. The base was to be self-sustaining and mobile, in the sense that disassembly and reshipment of its facilities to forward areas and resumption of normal operation could be accomplished with a minimum of delay. The base was to be capable of keeping 80 landing craft in repair. The base called for was established by the 27th Battalion at Carter City on Florida Island, between April and August 1943. Warehouses, tropical-hut housing for officers and men, and other camp facilities were provided. One 350-ton, 6-by-24 pontoon drydock for LCI's was assembled. On August 22, 1943, the operation of the repair base was taken over by CBD 1008. The 27th Battalion also constructed facilities on Gavutu Harbor for the functioning of two amphibious boat repair and training centers and the training of their crews prior to forward-area assignment. The base at Turner City, on Florida Island, included camp facilities for 400 men and officers, a pier, 10 feet by 130 feet, a 2-by-12 pontoon finger pier for small craft, and two steel arch-rib warehouses to be used as shops. At the base on Gavutu, steel arch-rib buildings were erected for shops and two 10,000-barrel aviation-gasoline tanks were built concealed in a hillside. An existing concrete wharf, 125 feet by 150 feet, providing 20-foot-draft berthing space, was repaired and equipped with a marine railway. These facilities were essentially completed by August 1943. In December, the 34th Battalion installed a second marine railway on Gavutu and practically doubled the capacity of the boat nest for small landing craft. The boat nests consisted of rows of piling driven in 50-foot squares with heavy steel mooring cables stretched across the top of the piles. Supporting facilities for the Gavutu base, including a 10,000-barrel diesel fuel tank, were built on the adjoining islands, Tanombago and Palm. Hospital Facilities - Illness was even more prevalent on Tulagi than on Guadalcanal. Medical facilities, as established, consisted of a 200-bed hospital at the Halavo seaplane base and the "Blue Beach" Hospital on Tulagi. 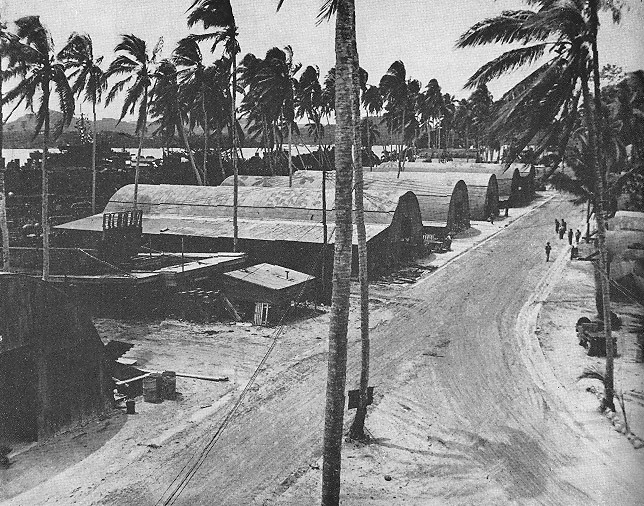 The first 200-bed unit at Blue Beach, consisting of 35 quonset huts originally part of Cub 2, was completed by the 27th Battalion in May 1943. In August, plans to expand the hospital to a 450-bed unit were formulated, but because of materials shortages, the expansion was not completed until November. Waterfront facilities - Waterfront facilities at Tulagi Harbor were improved and extended by the Seabees. The 6th Battalion installed a five-ton stiff-leg derrick, built from Japanese structural steel and powered by a salvaged Japanese automobile engine, on Government Wharf, and the wharf, built of timber, was enlarged by the 27th Battalion. The 27th also constructed Sturgess Wharf, with a 140-foot face and 40-foot water depth. The Seabees assembled pontoon barges to aid in unloading operations. In October 1943, Company B of the 9th (Special) Construction Battalion arrived at Tulagi for stevedoring activities. A salvage wharf was built at Tulagi with piling, framing, and decking cut by the 27th Construction Battalion logging and sawmill crews on Florida Island. General experiences on Tulagi - Native hard woods, produced by the Seabees' logging and sawmill activities, were extensively used at Tulagi. Logging was an unusually difficult operation, for the men had to work in mud all day, guarding themselves against crocodiles, poisonous vines, and fungus infection. The Japanese did not bomb Tulagi until February 1943, after the close of the Guadalcanal campaign. However, from that time until the following June, the Seabees were subjected to occasional air raids. Men of the 27th Battalion were given partial credit for the downing of three Japanese planes. When CBMU 521 reported at Tulagi in December 1943, all the Seabees had left with the exception of the 34th. That battalion was relieved by the CBMU 505 in March 1944. In early 1945, when the Solomons area was well behind the front lines the CBMU's secured several of the activities and crated usable materials for use in forward areas. Work shops and Marine Railway at the Landing-craft Repair Base, Carter City (source: same as map above) Note on the left of photo a landing craft in dry dock, the front ramp of the landing craft is easily seen. When ship repairs could not be completed successfully at MTB Base 9 on Stirling Island, PGMs of Division One were repaired at Carter City as detailed in the ship logs for PGM-3 and PGM-7. Here is one example derived from the log of PGM-3. On June 22, 1944, while patrolling the southeast coast of Bougainville Island, a vibration developed in the propeller shaft connected to the port engine, which was secured (shut down) at 0633 hours. Two days later, back at Base 9, divers tore down the port screw to determine the extent of damage. A repair could not be carried out at the base. On June 27, PGM-3 departed Base 9 at Stirling Island in the company of PGM-1, passing through the submarine net at the western entrance to Blanche Harbor at 0718 hours. By 1423 hours the ships had passed to the west of Simbo of the New Georgia group, the island bearing 27° true, and at 1030 the next day had arrived at the entrance to Purvis Bay (not far from Carter City). The distance between the MTB Base at Stirling Island and the entrance to Purvis Bay, taking a route around the New Georgia group to the west, is approximately 320 nautical miles. The PGM-3 log lists its speed at 11 knots during the early morning of June 28. Using that figure for speed, the ship would have traversed 297 nautical miles during the 27 hours detailed for the trip in the log, a figure that is comparable with the distance of 320 nm determined by map (map is available here - very large map, 4994 X 3947 pixels, 4.35 MB). PBY Base, Espiritu Santo (source: same as other photo). Note the ramp at lower left. The seaplanes would land on the water then use the ramp to taxi. This base is presumably similar to the one at Halavo on Florida Island although smaller.